Phil Normand of Recoverings (www.recoverings.com) gave a wonderful presentation at Dum Dum and now he has put up some great images on Facebook at this link: Phil Normand Wall Photos. 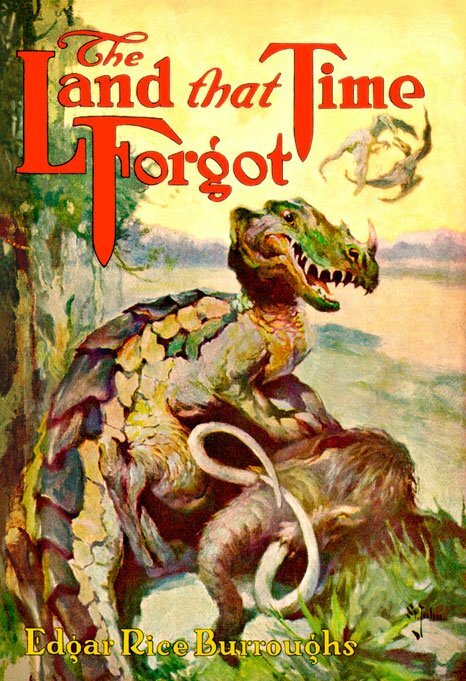 (You will have to be logged in to Facebook for the link to work, and if that doesn’t work, try: Recoverings Replica Dust Jackets for Edgar Rice Burroughs First Editions on Facebook) In the meantime, here are just a few of the great slides and descriptions he put up there. He put up a total of 24 – -this is just the tip of the iceberg! In 2006 Recoverings produced the limited edition, full-color design for an alternate dust jacket for the book using the J. Allen St. John cover art for the “Giant” story as it appeared on “Amazing Stories” in January, 1941. Since it was acknowledged by 1963 that the title tale had been written by John Coleman, I decided to make the author attribution a reference to ERB rather than a byline. John Coleman’s participation was also signaled by the use of his title lettering from the Sunday comic strip that he had drawn in 1941. 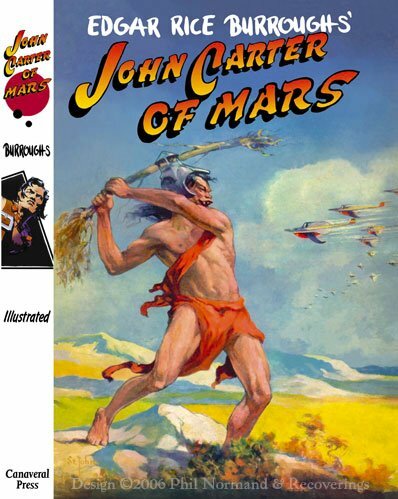 I also used a drawing of John Carter from the strip as an illustrated device on the spine to match the style of the jacket with those that were produced by Edgar Rice Burroughs, Inc. for their publications. The back cover uses the same photo of Ed, hand colored, along with reproductions of the two pulp covers for the original appearances of the stories. 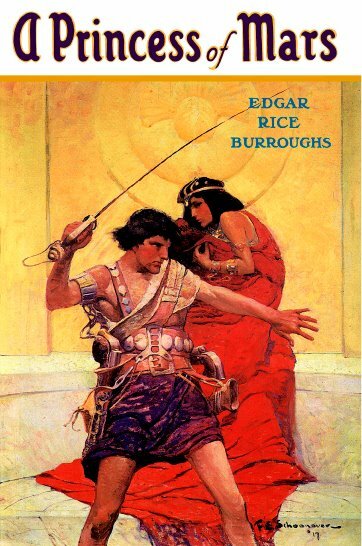 A PRINCESS OF MARS, the first novel written by Edgar Rice Burroughs is published this day by A.C. McClurg and Company in an edition of 10,200 copies. Though superseded in hardback publication by the first four Tarzan novels, this was actually the first ERB story to see print, coming out in The All-Story magazine from February to July of 1912 with the title, “Under the Moons of Mars.” The overwhelming response to the story prompted the managing editor, Thomas Newell Metcalf, to accept ERB’s third manuscript and publish TARZAN OF THE APES in full in the October issue. 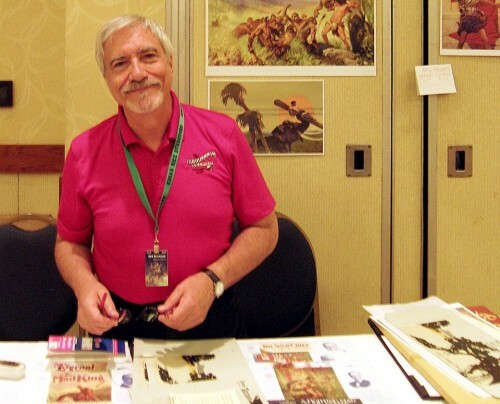 The first of the John Carter trilogy, it initiated a new genre of “interplanetary romances” often copied by other writers of the period and responsible for the generation of popular characters from Flash Gordon to Luke Skywalker. Attempts have been made to translate the book into film since the mid-seventies, but not until recently has special effects technology been capable of portraying the look and feel of Burroughs’ Barsoom. March of 2012, the centennial anniversary of the debut of Burroughs’ most seminal characters, will mark the release of a long-awaited film based on the much-loved classic of science-fantasy from Andrew Stanton and Pixar Studios. 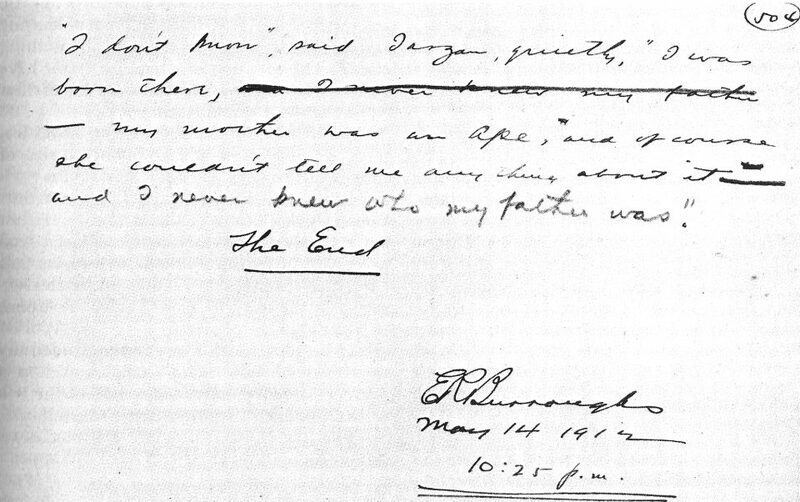 May 14, 1912: At 10:25 p.m. Edgar Rice Burroughs finishes the manuscript of his most famous creation, Tarzan of the Apes. Begun on December 1, 1911, the story was the third that Ed wrote and though it had been planned and worked on for a long time before he set pen to paper, he wasn’t sure it was going to sell. Thomas Metcalf, editor of All-Story was immediately enthusiastic however, and the tale was printed full-length in the October, 1912 issue. Greeted with hearty praise by the readers, the Jungle Lord has endured as an archetype for 100 years despite ridicule, bastardization and dismissal by critics, motion picture companies and academics. Tarzan remains one of America’s great contributions to imaginative literature and popular world culture, recognized all around the globe as a character who speaks to the deepest parts of the human psyche, equally unbound by civilization and yet more noble in bearing and motivation than any merely human hero. April 20, 1918: TARZAN AND THE JEWELS OF OPAR is published in book form by A.C. McClurg & Co., Chicago. The fifth Tarzan novel was originally published as a serial in “All-Story Weekly” in five installments from November 18 through December 16, 1916. The book includes additional material, approximately 7,300 words of it, that was not in the magazine serial. J. Allen St. John produced the cover painting, with title lettering, as well as eight drawings and a hand-lettered title page for the volume. This was a very popular Tarzan title and went through one McClurg reprint and three A.L. Burt reprints. It was also serialized in 1918 by the Chicago Herald newspaper accompanied by 17 gorgeous pen-and-ink drawings done especially by St. John for this appearance. The paper syndicated the story and illustrations in an unknown number of newspapers and ERB scholar Robert R. Barrett discovered the version in 1954 in the Wichita library’s files of the Wichita Eagle. Phil — thanks for sharing these wonderful images and thanks for all that you do.